There are so many benefits to being a part of the Stampin’ Up! family and more specifically to my team. I figured I would list some here for you. Feel free to comment as I may have missed some. The Starter Kit is the best deal in the catalog. This is the only place that you can pay $99, get FREE shipping, and get $125 in product with no obligation. Shop at a 20% discount (if not more) all the time. Get to travel for OnStage to learn more about stamping and get together with fellow demonstrators. Have access to online communities exclusive to Stampin’ Up! demonstrators. Get to pre-order new products ahead of customers. Receive a weekly e-mail to help you succeed as well as a quarterly magazine. You get me and my 12+ years of experience as a demonstrator. Access to an exclusive Facebook group only for the Red Door Team. And most importantly, a chosen family to encourage you. If you have questions about joining or need help with what to place in your Starter Kit please contact me. I am happy to answer them. 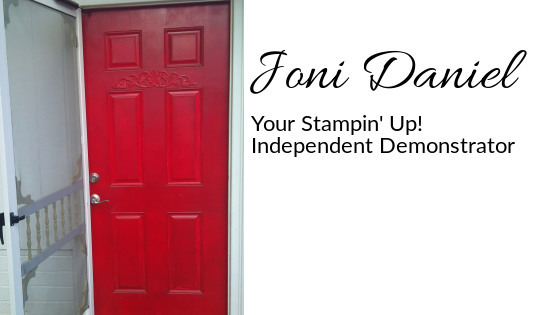 If you are ready to join please go to http://www.stampinup.net/esuite/home/jonidaniel/jointhefun.